Carlsbad’s anti-development forces will likely shift back into high gear as the Planning Commission meets next Wednesday to discuss the environmental impact report on what’s called The Ponto Beachfront Village Vison Plan. The plan envisions 180 hotel rooms and 126 time-share condo units in a resort overlooking Batiquitos Lagoon; a 215-room Hilton at Poinsettia Lane and Carlsbad Boulevard; and a third 269-room hotel on Ponto Drive where the storage units stand.. . The plan also proposes 128 attached condominium units in a mixed-use project on Carlsbad Boulevard north of Avenida Encinas.. . . Interspersed would be shops, restaurants and a wetland interpretive park all linked by a trail, and a pedestrian underpass to South Carlsbad State Beach. Wow, Carlsbad’s stretch of Coast Highway could look just like Newport Beach’s. Joy. 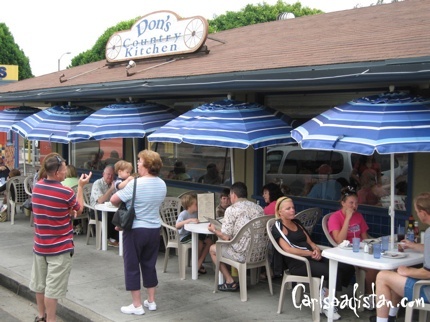 As much as we hate the idea of blowing out our favorite local breakfast spot, we would be remiss is we didn’t mention the cleanest, smoothest, warmest spot for morning meals in Carlsbad: Don’s Country Kitchen located at 2885 Roosevelt St. in The Village. The first thing to know is that there is no Don. So don’t ask for him. Up until six and a half years ago there was a Bob, but then Bob and his wife sold the restaurant to Roberto Sanchez. And Roberto did the right thing: he left the menu untouched and kept rolling with the same great tasting food. Click the link for rest of the story. According to the North County Times, a liquor store was robbed in “the 2700 block of State street” last night at 8:57 PM. We’re going to hazard a wild guess and say that it was most probably the Fiesta Liquor and Deli at 2700 State St. The gunmen [was there more than one?] fled with cash, authorities said. No other information was available Thursday night. 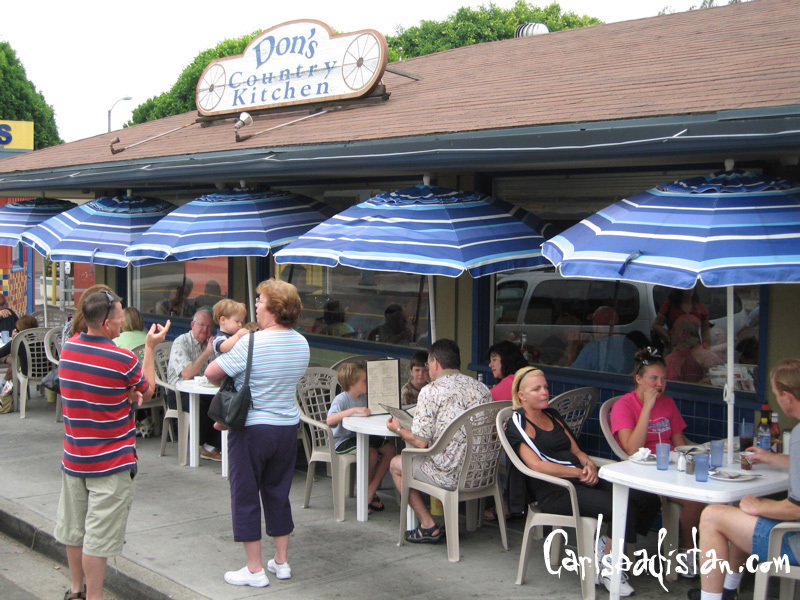 Want to test out 15 different Carlsbad restaurants in one afternoon without being a total pig? Then roll up to the 11th Annual Taste of Carlsbad on September 22, 2007 from 2:00 to 5:00 p.m. on Armada Drive above the Flower Fields. Tickets cost $20 and are on sale now at the Carlsbad Educational Foundation office 5651 Palmer Way, the Carlsbad Unified School District office at 6225 El Camino Real and the Convention and Visitors Bureau at 400 Carlsbad Village Dr. or to order tickets call: (760) 929-1555. Carlsbad-based weight management company Jenny Craig, is happy to announce that after three years pursuing a “consulting career” Jim Kelly is back as CFO (a position he held at the company from 1999 to 2003). Yes, consulting is fun, but even accountants realize that there’s nothing better than a steady paycheck. At a private, two-hour long meeting Carlsbad City Council decided that if they want to find the right professional City Manger to replace Ray Patchett then they are going to have to hire a professional to find the professional replacement. You know, if they want to be professional about it. “Generally (finding and hiring) any executive manager is a several-month process,” said Denise Vedder, Carlsbad’s communications manager. According to the North County Times Barbara Henry Vedder did not include details on exactly when the recruiting process will start and how much it would cost. To add to that Patchett has still not announced exactly when he is leaving. On Friday evening August 31 the Leo Carrillo Ranch Friday Night Film Festival will present the 1931 film Guilty Generation which follows 1930’s era gangsters in a premise based William Shakespeare’s Romeo & Juliet. In this film, Leo Carrillo plays Mike Palmiero. John Smith is a young architect who changed his name from Marco Ricca when he realized that being a notorious bootlegger’s son was not likely to help his career. Maria Palmiero’s father is also a bootlegger, and she’s finding that the high society circles she wants to move in are not very welcoming to her. Naturally, John and Maria’s fathers are waging a brutal gang war back in New York, and naturally John and Maria fall in love. Bring a low back chair, warm clothes, a flashlight, and a blanket. The movie starts promptly at sunset with a showing of the Cisco Kid before the main feature. Admission is free and hot dogs, chips, popcorn, cotton candy, and sodas can be purchased at the Barn Theater. The next two Fridays will feature the following films: If You Could Only Cook, and I Promise to Pay. Carlsbad’s Invitrogen Corporation (the life science technologies company) has been awarded the contract to provide “kits for detecting possible E. coli 0157 contamination in food at the 2008 Summer Olympic Games in Bejing, China. We’re wondering if they sell to the general public as a couple of those test kits would be the perfect thing to take our our next surf trip to mainland Mexico. 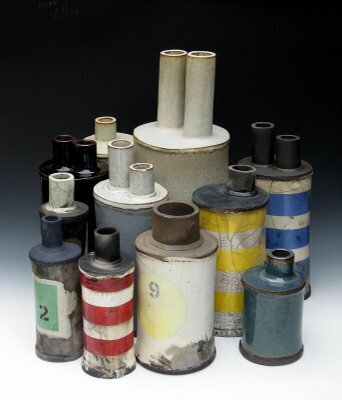 This week is the last chance to check out Carlsbad artist Ted Gallup’s ceramic art display at the Georgina Cole Library in Carlsbad. According to a profile in the San Diego Union Tribune Gallup is a project manager at a health care company, but spends his free time handcrafting ceramics pieces in the studio at Palomar College. Gallup’s art is not the typical pottery we’ve all seen too much of at street fairs and art walks. His pieces range from architectural to playfully graphic yet each is oddly intriguing and seem to demand closer inspection. Friday will be the last day to see his art at the Library, however, you can see more of Ted Gallup’s ceramics on his blog at http://tedgallup.blogspot.com/. In the 2007 NHRA POWERade Drag Racing Series Funny Car points standings Carlsbad’s Ron Capps is on top, but apparently all that goes away as the season winds down to the Countdown to Four this weekend at the Mac Tools US Nationals at O’Reilly Raceway Park in Indianapolis, Indiana. The good news is he has a secret weapon. That’s crew chief Ed McCulloch, who has won more U.S. Nationals Funny Car titles than any other driver. McCulloch had claimed five Funny Car victories (1971, ’72, ’80, ’88, ’90) and one Top Fuel win (1992) at this prestigious event before he retired as a driver at the end of 1993. Both Capps and McCulloch have competed in seven Showdown bonus events. This weekend will mark Capps’ eighth appearance in the Showdown. To keep up with Ron check out his blog at Brut Racing, or watch the U.S. Nationals on ESPN 2 on Sunday August 2, at 8:30 AM Carlsbadistan time.